You are a chip off the old block. You’re just like your father. Just like your mother. Cut from the same cloth and the apple doesn’t fall far from the tree – which was okay when you were a kid. Back then, you wanted to grow up just like them anyhow. Or not. When you’re the child of a parent with an unusual career – for instance, if you’re “The Undertaker’s Daughter” – you might, as did Kate Mayfield, pick another path. Kate Mayfield spent most of her young life surrounded by death. Just after she was born in the late 1950s, her parents moved the family to tiny Jubilee, Kentucky , where Mayfield’s father had decided to open a funeral home. There were two funeral homes there – one for Jubilee’s black residents and one for whites – but he reasoned that there was room for competition. He didn’t reckon on the town’s Old Guard, which closed ranks among themselves and almost stopped the newcomer in his tracks. Slowly, though, and with the help of one of the town’s most eccentric and forward-thinking residents, Mayfield’s father was accepted in the small town and his business thrived. He hired a few locals for help when times were busy and, as was the norm then, he also ran one of the town’s ambulances. The family lived in an apartment above the coffins and embalming room, Mayfield’s mother worked her way into the town’s social life, the Mayfield children settled into Jubilee’s schools, and the dead came and went at Mayfield and Son Funeral Home. But Jubilee was no Mayberry. Racism was a way of life there and, though Mayfield says that the family maid was sometimes her only friend, there was an otherwise strict separation of black and white. As time passed, life in the small-town became a cauldron of gossip and sniping; Mayfield was reprimanded by teachers and taunted by schoolmates for liking a black boy; and The Old Guard continued to plague her father, whose secrets began to affect everyone around him. Mayfield, a teenager by then, knew her family would never leave Jubilee…. but she couldn’t wait to go. You might think, for example, that the title indicates a tale of living with a funeral director, but you’d only be partially correct. Author Kate Mayfield includes plenty of funny, heartfelt, sad memories of life above death, though she starts her book with a game of bridge and a love letter to small town life, a lifetime ago. And yet – we see the dark spots, and the love letter soon becomes a Dear John letter. For that, I buried myself in this book. While you may (rightly) see comparisons to a couple of popular works of fiction, remember that this book is a memoir – and a good one at that. 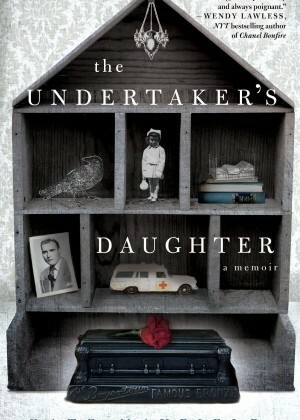 Look for “The Undertaker’s Daughter” and you’ll be glad to block off your time for it.